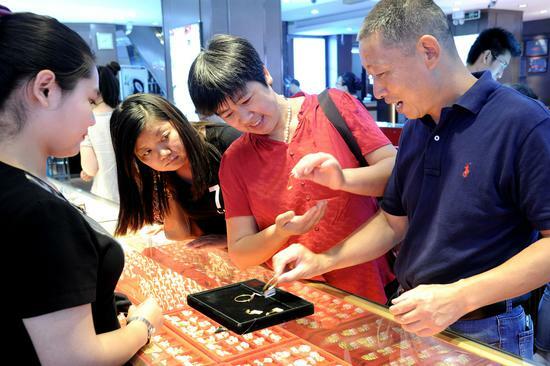 Rising affluence is continuing to stoke jewelry demand, resulting in rising consumption of gold in China, second-quarter industry data confirmed. According to David Harquail, chairman of the World Gold Council, robust gold consumption in China will likely grow further as long as the country's wealth keeps expanding. Harquail estimated that Chinese people will buy about 30 percent of the gold sold globally, mostly in the form of jewelry. Agreed Song Xin, president of the China Gold Association. He attributed the continuous increase in gold jewelry consumption to growing demand among younger Chinese consumers for gold earrings, bracelets and other kinds of jewelry. Globally, gold demand during the first half of 2018 dropped 6 percent year-on-year to 1,959.90 metric tons, the lowest level since 2009, the WGC said in its latest report on demand trends. In the second quarter alone, demand was down 4 percent year-on-year to 964.3 tons. Purchases for investment purpose fell 9 percent, the WGC said. But, during the same period, the yellow metal's consumption in China rose 7 percent year-on-year to reach 332 tons, a three-year record. Analysts said consumption is expected to continue to rise on the back of strong demand and growth in high-end sectors like jewelry. China has for long been the dominant player in the global gold industry. "The industry is moving to produce more retail products to meet customer needs," said Zhu Yi, senior analyst of metals and mining at Bloomberg Intelligence. "The rise in second-quarter demand was mostly driven by consumption of jewelry, gold bars, coins, and the growth rate is faster than that in the first quarter because of investor concerns amid (China-U.S.) trade tensions." The global slump in gold prices since April has further stimulated the already strong demand in China, said Zhu. "The price drop due to the China-U.S. trade tensions, the growing strength of the U.S. dollar, and the depreciation of the RMB will further drive gold demand in the second half." International gold prices, which were at $1,302.70 per ounce at the beginning of this year, dropped toward the end of April and closed the first half at $1,253.20 per ounce. However, domestic gold consumption during the first half reached 541.22 tons, a slight increase compared with the same period last year, CGA data showed. The CGA said gold consumption in China reached 1,089.07 tons in 2017, up 9.41 percent, with demand for gold jewelry, gold bars and industrial-use yellow metal surging. The jewelry segment's consumption was up by 6.37 percent year-on-year to 351.84 tons, it said.